Will ‘Less is More’ Work in New York City? A sub-theme articulated in Traffic is the “slower is faster principle,” in which reductions in capacity or seeming performance can actually lead to no worse — and often better — outcomes vis a vis traffic flow. 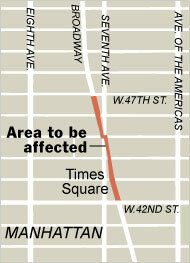 Broadway traffic would also be barred in Herald Square. 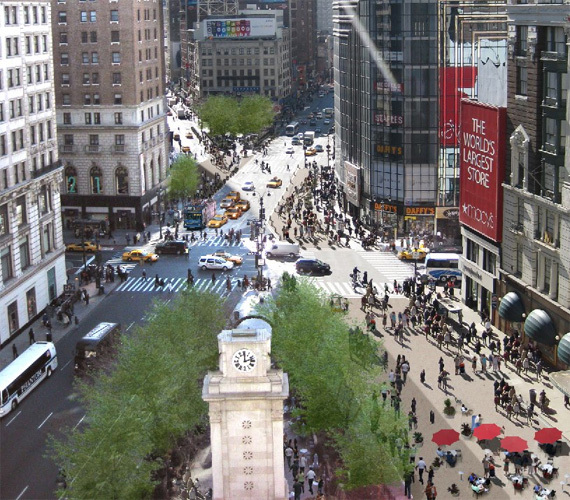 … [Jeff Zupan] said Broadway tended to foul up traffic at each intersection with an avenue. To allow for green lights on Broadway, the duration of the green lights on the avenues and cross streets had to be shortened, backing up traffic. What will be gained, depicted below via Streetsblog, is a rare pedestrian refuge (and a shorter, safer pedestrian crossing) in an unwelcoming area where foot-traffic seems to dwarf vehicular traffic. And while the results on traffic flow will certainly be worth following, that of course should not be the only consideration in judging the project’s success or failure. While not as radical perhaps as the early 1970s Madison Avenue pedestrianization, this one may have a better chance of succeeding. Comments Off on Will ‘Less is More’ Work in New York City?. Click here to leave a comment. Fooled Drivers, or Foolish Drivers? I’m not sure if, lurking somewhere in NHTSA’s databases, there’s a category for “Car-House Crash” (no worries about coding for culpability there! ), but, judging by the news reports I get, it happens more than you’d think. Johansen and other area residents blame the accidents on a reconfiguration of the Park Lawn-South Kingslea intersection a few years ago. The new intersection was moved a few metres west, and curves to the left just before the stop sign. But a laneway to the right, near the stop sign, can create an optical illusion that may fool some drivers into thinking it’s South Kingslea, and that the stop sign is in a traffic island in the middle of the intersection. As a result, they end up on the wrong side of the sign. At least that’s the theory of Allan Smithies, who’s in charge of traffic planning in that area. I haven’t been to the intersection in question, and it’s hard to draw inference from a photo, but as pictured above, I’m not quite sure what the source of confusion is. I see a Stop Sign, I quite plainly see a house. More importantly, I see other houses. It is a neighborhood. Neighborhoods are places where you don’t drive at speeds that would prevent you from not being able to crash into a house. The local response was to place a set of “jersey barriers” in front of the house. The idea of living like the American embassy in Beruit didn’t please the homeowner. 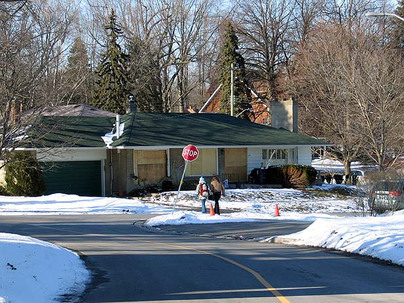 But after assessing the path of the two vehicles that ended up in his house, Johansen said the barricade would be more likely to stop another vehicle if it was put up on the other side of South Kingslea, next to the stop sign and across the sidewalk on the east side of Park Lawn. “I don’t want that ugly cement wall across my front yard, especially when it won’t stop another car,” unless it’s positioned across the laneway, he explained. Rather than allow the barrier to be dropped in his yard, which he says would stigmatize his home as the target for airborne vehicles and not prevent further assaults, Johansen said he told city workers to stick it. I can utterly side with the homeowner’s sentiment on this. Residential streets are not meant to be places for guard-rails, concrete barriers, and other aspects of the “forgiving road,” just as residents should not have to wear crash helmets when they go out for a walk. As I’ve argued here before, I’d rather see trees planted mid-block, every block, in the center of the block. Apart from that, there must be some better solution here than jersey barriers, any host of traffic calming treatments. Of course, one doesn’t usually have to dig too deep in these stories to find the real source of the problem. Around 1 a.m. yesterday, a car driven by a 25-year-old man hit a curb, flew through the master bedroom window of the house and landed on the residents’ bed. Police say alcohol was a factor in the crash and the driver has been charged with impaired driving. This takes “breaking and entering” to a new level. But in any case, we see that it wasn’t necessarily some strange road illusion causing the problem, it was the fact that the driver was hammered. He was creating his own illusions. Neighbours in the area say many people don’t heed the nearby stop sign, which has been taken out a few times by previous collisions. Now, I agree that good design of any sort should help users avoid unnecessary mistakes, or at least not make them more prone to make mistakes (TV remote-controls are notorious for this). But at what point do we say enough’s enough? As Hans Monderman has said, there are some drivers which no road can save. As, I’ve argued in Traffic, bringing the “foolproof” design of the forgiving road into places like neighborhoods not only cheapens the neighborhood, it increases the risk-taking behavior of drivers. I noticed that one poster referred to the fact that the “sightlines” were good; the problem with “sight distance” is that drivers simply consume the extra visibility with greater speed. It could even be that the stop sign itself is a problem — drivers are looking at that rather than scanning the actual terrain. Or maybe it’s just a Canadian snow and ice thing. Now, I realize I’m sounding off here, and I recognize that traffic engineers, who must wrestle with the many-footed beast of human behavior, do not have an easy job by any means. If this finds its way to Mr. Smithies (or the homeowners) I’d be curious to hear more about the case. Comments Off on Fooled Drivers, or Foolish Drivers?. Click here to leave a comment. – Riverside, Calif., with the third-highest level of home foreclosure activity last year, saw the highest drop in traffic congestion. – Detroit, where unemployment rose about 21%, saw the second largest decrease in congestion, tied with San Diego. – The most dramatic drop in congestion occurred on Wednesdays, with a 31% drop. – 99 out 100 most populous cities tracked by Inrix saw a decrease in traffic congestion last year from the previous year. The one city where traffic got worse last year: Baton Rouge, which saw a 6% increase in congestion from 2007. Detroit is obvious, less sure about why Wednesday would see a particularly big drop. Comments Off on Decongestion. Click here to leave a comment.